Scotland’s Premier High Energy Ceilidh Band! When it comes to Scotland’s most famous national product, single malt whisky, the phrase cask strength is synonymous with purity, high-concentration, sophistication and premium market quality. Similarly, when it comes to Scotland’s next most celebrated national product, its vibrant music scene, the Cask Strength Ceilidh Band more than lives up to its name. Renowned for their master musicianship, experience, professionalism and spirited performances, the band has graced stages around the world from the Royal Albert Hall to Edinburgh Castle, and London’s Hyde Park to New York’s Tartan week. Their fun approach adds bucket-loads of energy and fun to any event. If you value high quality Scottish music then look no further. Driving reels and jigs played with ferocity intertwine with a high-octane rhythm section that delivers an infectious sound designed to do one thing – get everyone up on to the dance floor. 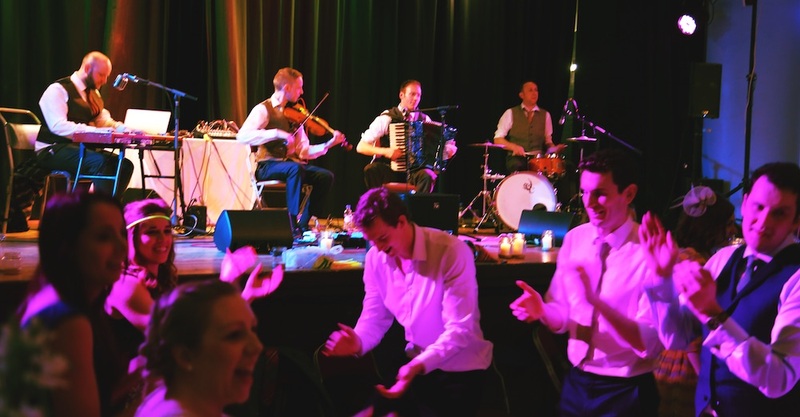 The Ceilidh dances are all called by the band members, with many years of experience taking even the most untrained dancers through their first Ceilidh steps. The band can also provide a disco service with songs and hits from all the decades guaranteed to get you up dancing. Professional, reliable, friendly and fun, we’d be delighted to play at your event or special occasion.